I finally got around to scanning in a pile of various things I’ve picked up over the past year, and this is one of the cooler ones. 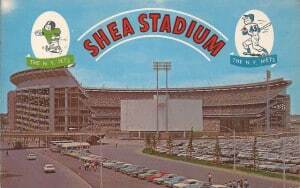 It’s not just the 1964 view of Shea Stadium in its first year, featuring the colored panels hanging outside the ramps, the old buses parked near the subway bridge, the vintage cars in the parking lot and the cartoons of the Jets and Mets (interesting number choice, by the way; No. 45 wasn’t worn until 1964, by Ron Locke). Those things are cool, but it’s a pretty common postcard. I’ve seen it plenty of times. What made me buy it was the back — be sure to note the date it was sent. First of all, I love old postcards that have been sent. I don’t need to know anything about who sent it, who received it, or where it went. It’s interesting to me just to get this small little window into one brief moment of a day or a trip in someone’s life, decades ago. Of all the things they saw, experienced or had to tell someone, what was it that made them choose these details? But back to this postcard: The Mets won the 1969 World Series on Oct. 16 at Shea; this postcard was mailed six weeks later from Flushing. Interesting choice by “Sidney,” who makes no mention of anything but Broadway, the weather, and her (his?) flight. No talk of the Mets, no mention of the ballpark, no indication of why this postcard was chosen. It’s a shame Pearl Bailey wasn’t in that Saturday performance of “Hello Dolly” — Bailey and Cab Calloway starred in a very successful all-black production of the musical, and Bailey won a Tony Award in 1968 for her role — because therein lies a connection not to just to baseball and the Mets, but also Game 5 of the ’69 Series. A big Mets fan, Bailey sang the national anthem before Game 5 and took home a clump of sod from the field after the victory, according to The Amazin’ Mets 1962-1969, by William J. Ryczek. 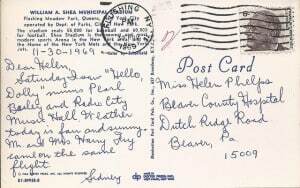 I wonder if Sidney had any idea of the subtle connection between that star and the front of the postcard sent to Miss Helen Phelps in Beaver, Pa.